For those who have had a Brussels sprouts related childhood trauma, I’m here to help. Anything followed by “& Bacon” can’t be bad, now can it. Slice a little of the stem end off each sprout, then thinly slice the sprout into strips with a knife or with the slicing attachment of your food processor. Make ahead tip: Toss with lemon juice to prevent browning and into a zip top bag. Keep in the fridge for overnight. Slice the bacon into small cubes, saute in a large fry pan over medium heat until bacon is crispy and most of the fat is rendered. Drain the bacon on paper towels, leaving the fat behind in the pan. 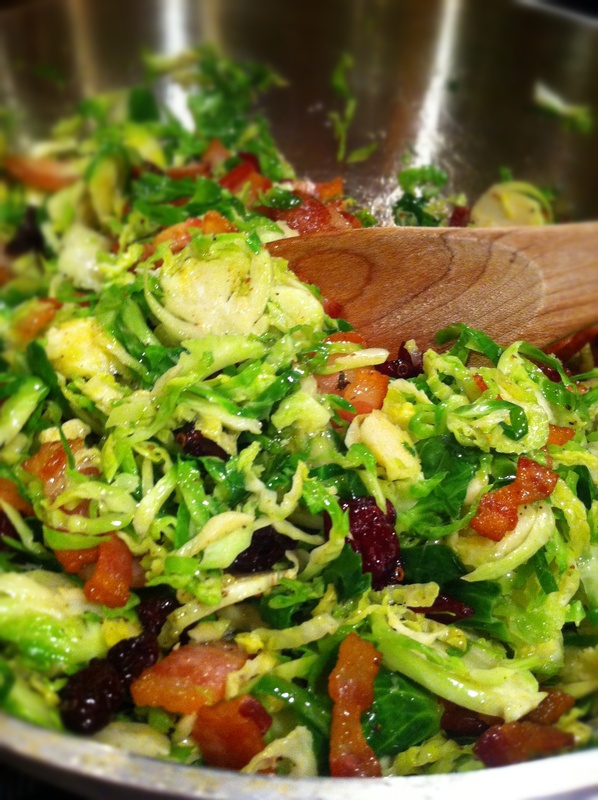 Toss the Brussels sprouts shreds with the bacon fat and cook until the sprouts are just softened and bright green, about 7-10 minutes. Sprinkle over the dried cranberries and reserved bacon. Serve hot.